Play if… you’re a fan of Stevenson and like old science. Avoid if… you’re afraid of transformations, allegory, or don’t like to read. Description (from the company website): Dr. Jekyll needs your help! He is transforming into Mr. Hyde much more often and he fears that he will soon be destined to remain as the hideous creature forever. Can you investigate within the laboratory and help him find the cure that will save him? Or will the same fate be your destiny? Staging Area: Small lobby with standing room and restrooms through the briefing room (which is where most of the seating is). Metro Access/Parking: We drove. I’ve no idea of the public transportation system down there. Description of the room: You begin in Dr. Jekyll’s lab. There’s your typical lab-found items, but you can see there’s a lot more than meets the eye (just without the Transformers). Understanding of the Mission: Upon entering the lab, you need to decipher the clues left by Mr. Hyde and figure out how to get into the freezer in the back of the lab before it’s too late and the potion is ruined. We helped Dr. Jekyll keep himself out of trouble. Having never been to Tennessee before, I took my first trip down there with Steph and, as usual, had to escape a room. I reached out to Perplexodus, as one of their themes based on Dr. Jekyll was both a new theme to me and kind of interesting. The owner of Perplexodus was happy to have us in and seemed really excited to have us try out the room. I was excited by her excitement. More often than not, we find owners are excited to work with us. Other times, they don’t give a damn. There’s been more of the former than the latter, thankfully. So with no expectation whatsoever, we went on our adventure to Tennessee, and to Perplexodus. Our GM, Dr. Jekyll, has recruited us (young scientists) to come to his lab and complete the potion that he was trying to make that will allow him to remain himself, permanently. He has found that as he’s been turning into Mr. Hyde more frequently, the episodes have been lasting longer. During the times as Mr. Hyde, he has realized he has killed numerous people and he’s anxious for the killing to stop. However, Mr. Hyde realized Dr Jekyll was trying to “kill” him and has created obstacles for Dr. Jekyll to stop him from finishing this potion. One of which was locking it in the sub-zero freezer in the back of the lab. Dr. Jekyll is afraid to go in the freezer to finish the work in case he turns back into Mr. Hyde and destroys everything. And that is where you come in. Solve the puzzles and riddles that Mr. Hyde has created, find and complete that potion, and get out of the freezer with it so Dr. Jekyll may remain himself. The mission sounded simple, but that Mr Hyde is a devious one. Most everything is hidden in plain sight, so it becomes that much harder knowing what is a clue and what isn’t. The freezer is locked with chains and 3 padlocks, which were the bulk of the padlocks in the room. The actual endgame was pretty cool, too (not the actual puzzle, but what you had to do). What’s that saying, variety is the spice of life? There were enough scientific quandaries here to keep anyone happy. Remember how I said hidden in plain sight? Well, you’ll understand when you play. I can’t go into much detail without giving things away, but suffice it to say the voices you hear are genuine, puzzles are solid, and the books are…useful. A handful of padlocks, a bunch of triggered results, ciphers, and riddles (both logical and visual) will keep you on your toes. There’s literally something for every type of thinker on your team. If I recall correctly we did get one or two clues, but considering the team was primarily Escape Room Virgins (ERVs), that’s not bad. I, myself, was stumped a couple of times and needed the team’s help with, and without, some direction. There was one thing I – initially – didn’t like, but it was never explicitly stated not to do what we had to do, so that makes it fair game. I blame myself for not asking the appropriate questions (or listening more closely). There were several puzzles we picked up on right away, and others that we looked at and came back too. There wasn’t much in the way of red herrings… just a couple of things you may think are used but essentially were not. Nothing overly difficult, I would say more tricky than difficult, but the spread would potentially be 3-6/7, which is pretty ok. The entire escape was set around three distinct paths, each one ending with a key or combo for a padlock on the door to the freezer. Once you got those unlocked and the door opened, there was a final culminating puzzle with the potion for Dr. Jekyll. I do enjoy the fact that this was an escape room done right (well, the way I would create them at least). Everybody can start off doing things however they want until there is a puzzle that is ready to be solved and progress through until that bottleneck to a final puzzle. I can’t state how important that fact is because so many rooms do it wrong/poorly. And again, I’ve never done a room based on Dr. Jekyll and Mr. Hyde, so I’m both impressed and surprised that it’s the only one and that it was done well. Our in costume game master was very good. 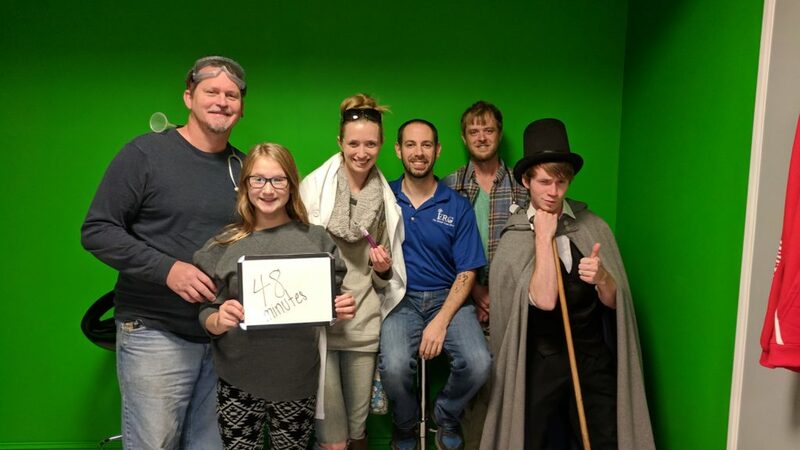 To receive your clues, you get their attention over the camera system and Dr. Jekyll himself (or Mr. Hyde for the second clue) would come in and give you a clue specific to a puzzle you asked him about. He was quick to come in, it wasn’t hard to get ahold of him, and there was no miscommunication based on a garbled intercom or anything like that. He was spot-on in getting us to realize our mistakes in a “not-to-make-you-feel-stupid” kind of way. That’s not to say I didn’t regardless, but that’s just me. Final Thought: All things considered, this was a fun room with some very *minor* flaws that can easily be overlooked because we had a good time playing through it. This is a novel theme (pun fully intended) and I think it’s a great way to revive a classic and bring it some new life. I fully plan on checking out their other rooms next time I have the chance to get back to TN.